Q: How do I tailor my message to a corporate audience? My biggest challenge is finding what resonates with corporate decision makers. After years working with the entrepreneurs, I’m finding that what resonates with them is NOT the same thing that catches the attention of the corporate decision maker. I am finding that the more I research the company (their values, initiatives, etc.) the easier it is to speak to them in their language. And, at times, I find myself wishing for a one-size-fits-all opening… what do you suggest? A: By identifying how corporate decision makers respond differently than entrepreneurs, you’re a step ahead of most. While I don’t have a one-size-fits-all solution, I do believe you can apply this customizable approach. The “Challenge. Solution. Invitation.™” formula provides a simple framework to create marketing messages that speak to your ideal clients but you must first know what motivates them. Click this link to read an article on LinkedIn that you might find helpful. What is the biggest challenge corporate decision makers are facing now? Once you are clear about the challenge and the solution, you’ll be able to craft a compelling invitation that positions you as the natural choice. 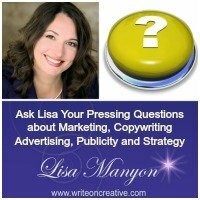 This entry was posted in Ask Lisa	on Monday	November 13, 2017 at 12:58 pm. You can follow any responses to this entry through the RSS2.0 feed. You can also leave a response.